Catch a train from Interlaken to Lauterbrunnen. Next take the cog train to Murren. Then take two cable cars to the Schilthorn. On the way back, walk from Murren to Gimmelwald. From there, take a cable car down to Stechelberg and the local bus back to Lauterbrunnen. On a sunny spring day, the hiking and the cable car views are both amazing. You might also be able to squeeze in a visit to Trummelbach Falls between the Stechleberg gondola station and Lauterbrunnen. The falls pass right through the mountain from the Eiger above. It’s more like an excursion into a mine than to a waterfall. Ride the Swiss Railway from Interlaken to Gundlischwand and then to Grindelwald. 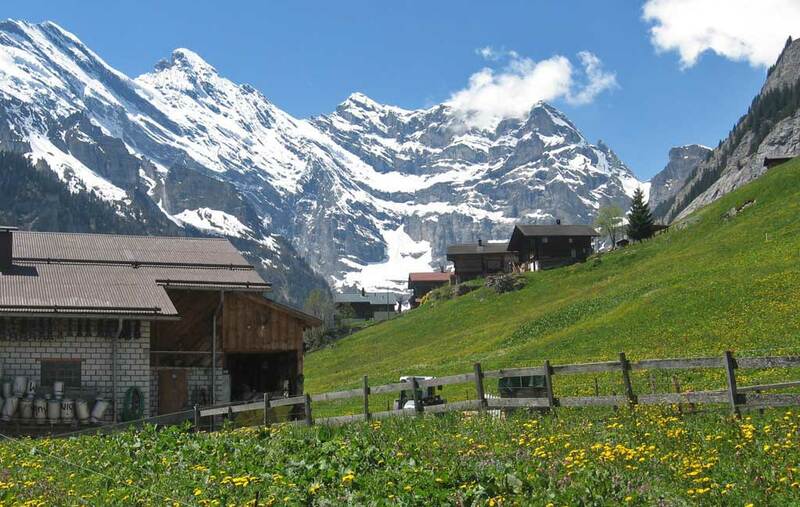 In Grindelwald, you can catch the Jungfrau Railway. 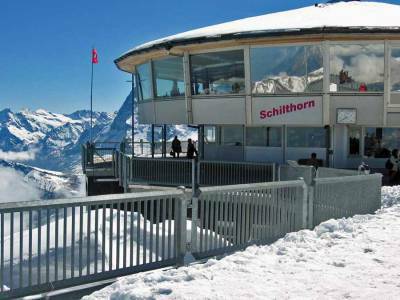 It goes to Kleine Scheidegg and then to the highest railway station in Europe at the Jungfraujoch. The train travels through a very long tunnel in the Eiger. The train comes out of the mountain at the saddle between the Mönch and Jungfrau peaks. There are two 5 minute viewpoint stops in the tunnel. One is the Eiger Wall (Eigerwand) and one is the Sea of Ice (Eismeer). At the top, visit the Ice Palace for a view from the inside of the glacier. The journey to the Jungfrau is very expensive. Even the Swiss Rail Pass offers only a 25% discount here instead of their standard 50% off for other special trains and cable cars. Take a half hour bus ride on Bus #21 from the bus station near the Interlaken Ost train station to Beatenbucht on Lake Thun (Thunersee). From there take a funicular and then a gondola up to the Niederhorn. Wander through the Old Town. Stroll the pathways along the river between the two lakes. Book a tandem parasail ride. They take you up into the surrounding hills and you parasail down into the town of Interlaken. It’s an extremely popular tourist activity that requires no previous experience. Head to the Harder Kulm Panorama Restaurant for lunch. It’s an 8 minute funicular ride after walking 5 minutes from Interlaken Ost. The restaurant looks over the valley, the city and the mountains. The views are fabulous on a sunny day. 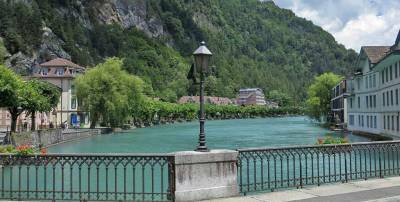 Even on a cloudy day, the glacial waters of Interlaken are a beautiful turquoise blue. 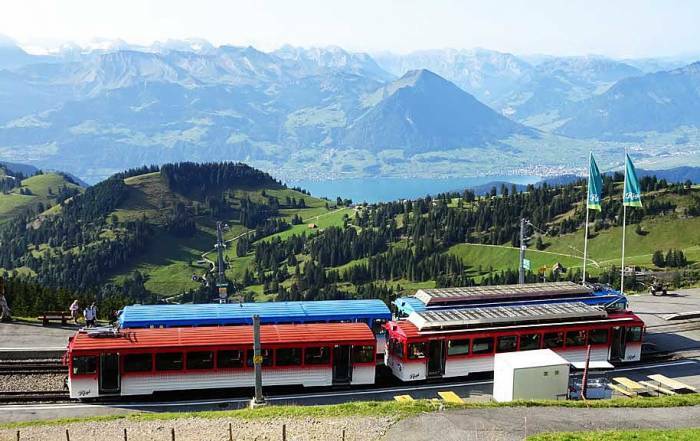 Take the cog wheel train from Wilderswil, near Interlaken, for a one hour trip to Schynige Platte. Spend a half or full day in the gardens. On a sunny day, enjoy excellent views of the Eiger, Mönch & Jungfrau and the Bernese Oberland. 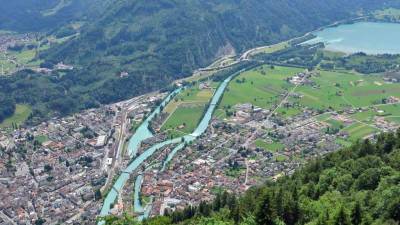 Interlaken can be very cool, because it is in a glacial valley surrounded by the Alps. So, the Interlaken weather in town is not necessarily a good indication of what’s happening on the mountains. July and August are the height of summer. Expect average highs of 75 F (24 C) and average lows of 55 F (13 C). During the winter months from December – January expect average highs of 37 F (3 C) and average lows of 27 F (-3 C). Precipitation levels are higher in the summer. June or September are excellent months to avoid the height of the summer tourist season and still enjoy comfortable temperatures. There are no major airports servicing Interlaken. 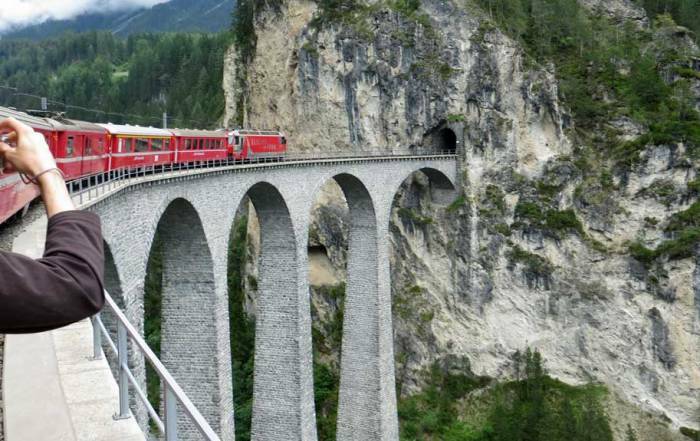 Most visitors get to Interlaken on the Swiss Eurail system. 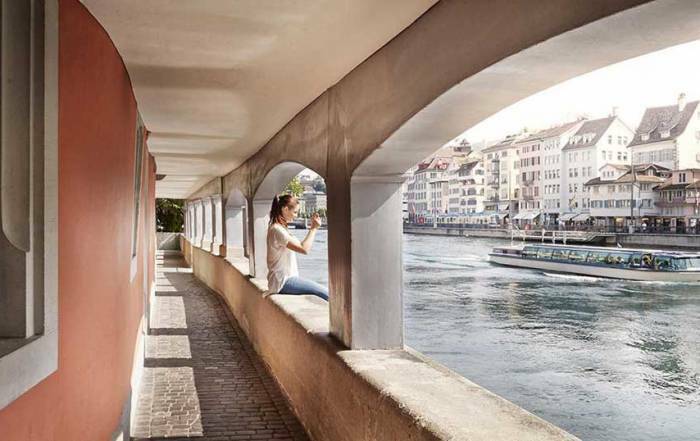 The train takes about 2 hours to get to Interlaken from Zurich’s international airport. 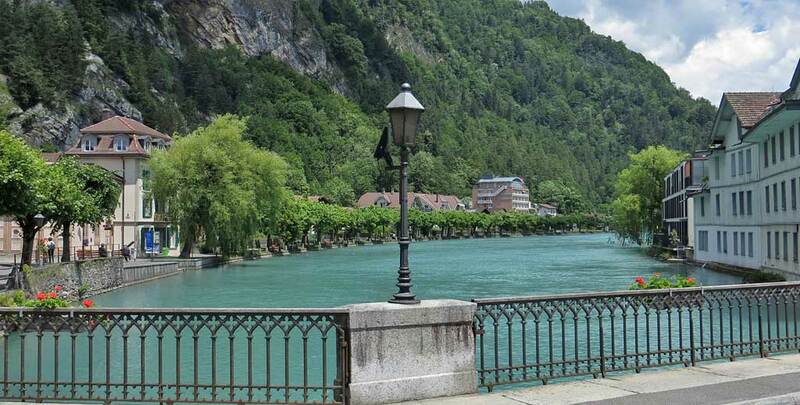 Interlaken is about 3 hours from Geneva. One of the longest tunnels in the world connects Interlaken with Visp and provides access to Zermatt. 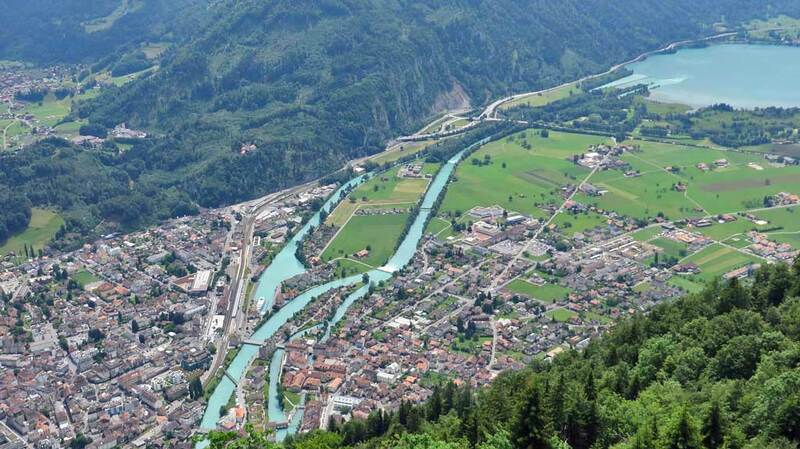 Since Interlaken is a small town, most places are within walking distance from the two main train stations – Interlaken Ost (East) and Interlaken West. 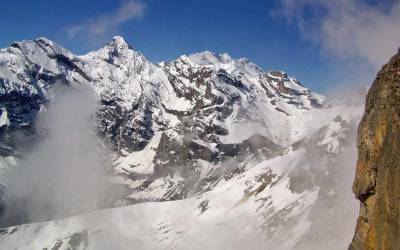 From Interlaken Ost there are a series of train and cable car gondola options to the Eiger or the Schilthorn. The geography forces you to pick one side of the valley and leave the opposite side for another day. 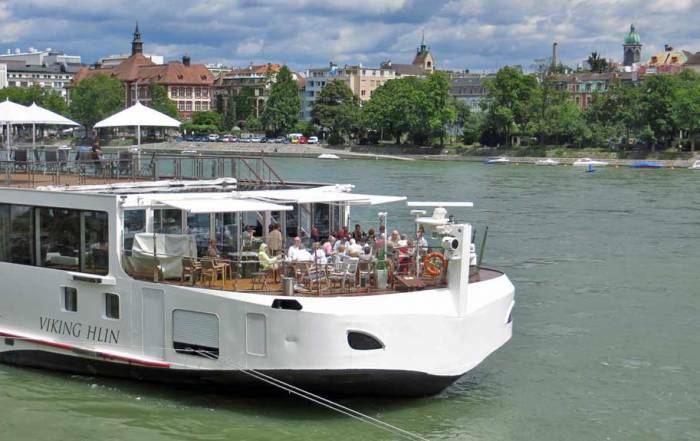 A Swiss Travel Pass includes 50% discounts on cable cars and 25% off the Jungfrau cog train. The Swiss Pass also provides free access to the buses in Interlaken and to the boats that tour Lake Brienz and Lake Thun. Interlaken is the heart of the Swiss Alps. The city is named for its position between two lakes – Lake Thun (Thunersee) and Lake Brienz (Brienzersee). 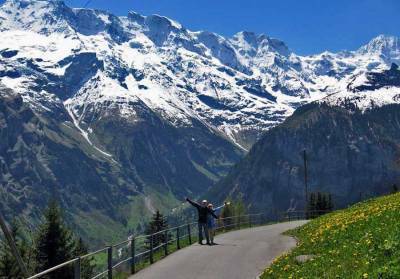 This area is known as the Bernese Oberland. Travel the trains, cog trains and cable cars up into the Alps in summer and enjoy the Sound of Music experience. 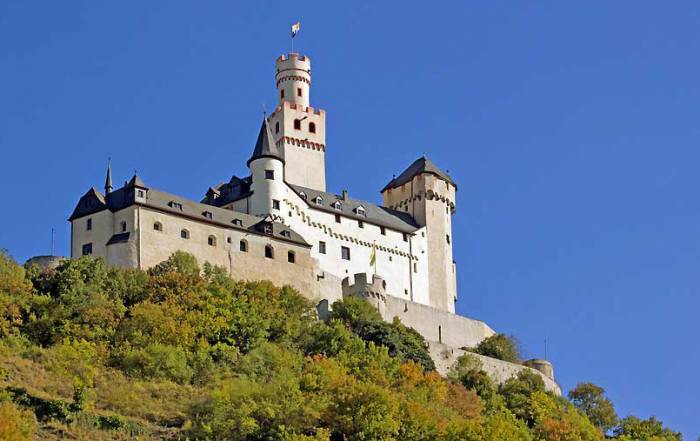 The movie was filmed in Salzburg though. 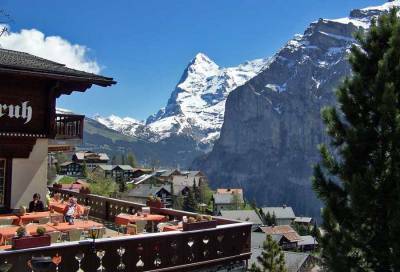 You can make Interlaken your base camp or stay at a number of small towns in the Grindelwald and Lauterbrunnen valleys. It’s the ultimate Switzerland experience. 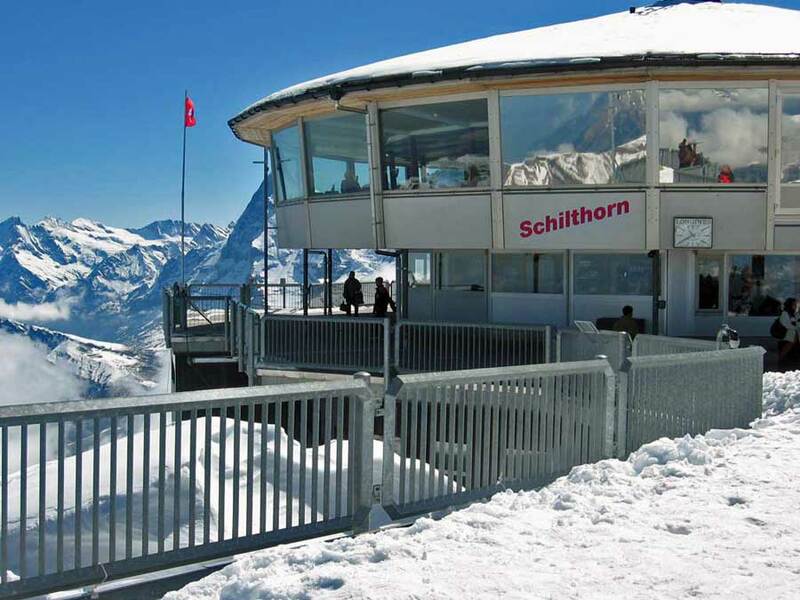 You can easily visit either the Jungfrau or the Schilthorn on a day trip. 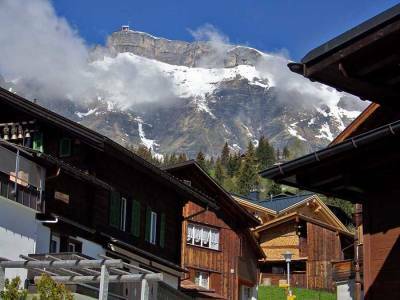 Pay careful attention to the spelling of towns, as Grindelwald and Gimmelwald are in different alpine valleys.